While feeding your dog once a day is acceptable, it is better to feed her at least twice a day. Don’t feed your dog cafeteria style. While it may be easier for you to keep food in her bowl, you need to know how much your dog is eating. The package will have information as to how much you should feed her per meal. Feed the amount that your brand suggests. Usually the amount will be calculated for his age and/or weight. Between feedings, store the dog food in a place out of his reach. Many dogs will eat just about anything, but, just as you don’t let a child eat everything they desire, you don’t feed your dog everything he will eat. Feed your dog the best food you can afford within your dog food budget. Your dog doesn’t understand nutrition; he only understands smell and taste. You must be the decider. A good place to start learning about what good dog foods are at Dog Food Advisor. 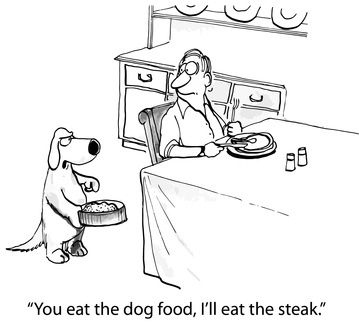 With the many brands of dog food available today, what you feed your dog is more difficult to determine than how much. Should your concern be your dog’s weight, his age, or brand ingredients? Should you be concerned with the company reputation? Dog Food Advisor is packed with articles about dog food, reviews of dog food brands, information on recalls and dog food news. The founder and managing editor, Mike Sagman, has developed a system to analyze the ingredients of each brand and rate it accordingly. All information is free and about as close to unbiased as you will find.